In late September, Virginia Mason launched our new virtual care clinics. Offering virtual care is a way to use technology to broaden access to care. Patients in need of a quick consult can connect with one of our providers who are available through secure, online video conferencing. Whether you have a cold or the flu, or accidentally sliced your finger instead of the carrots and can’t decide if you need stiches, virtual appointments are available 24 hours a day, 7 days a week for patients with non-emergency medical concerns. For more information, please go to VirginiaMason.org/Virtual-Clinic. Did you know that Down syndrome affects an estimated one in every 690 babies born in the United States? 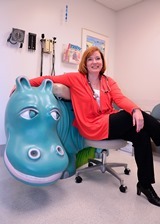 Virginia Mason Medical Center Issaquah’s Down syndrome program is led by Rebecca Partridge, MD, who was named one of the best pediatricians in the country by Parents Magazine in 2014. The clinic is designed to offer a unique range of services for each child’s strengths and challenges. The first of its kind in Washington state, the Down syndrome program welcomes referrals from primary care physicians and other pediatricians. Parents may also self-refer their children. For more information, please visit VirginiaMason.org/down-syndrome. To help support our patients on their wellness journeys, Virginia Mason is exploring a relationship with the YMCA of Greater Seattle. The idea is for patients to receive a referral to the YMCA’s diabetes prevention and/or weight loss management programs through their health care providers. Partnering with a YMCA health coach, patients would then work toward achieving self-identified health goals and improve their overall health. We look forward to offering this service later this year.